Reader Leighton Symonds was perplexed. Then a little bit of history. So… who was going to train the men who practiced in this field? And, particularly, who was going to select those from the ranks of the lawyers who could argue in the courts? The term “barrister” was originally a purely internal or domestic rank – a graduate of the Inn who had successfully negotiated the elaborate legal exercises set in Hall, which was laid out for moots like a court, with a bar. Although there were various attempts to regulate those who appeared in court, any requirement that they be barristers of an Inn of Court emerged at first only as a matter of practice – a case in 1590 finally confirmed it as a matter of law. And once that happened the process of excluding mere attorneys from membership of the Inns of Court was accelerated. So… what we’re really talking about here by the time of Anne Hutchinson’s paternal grandfather is being a law student there at Middle Temple, training for up to seven years, and then being called to the bar — admitted as a lawyer who could argue before the courts of the day — as a barrister. And if this is something that interests you — and how could it not be??? — take a gander at the archives of these inns. The records held are generally not court records or records of specific court cases, but are records of the people who passed through the doors of the Inns themselves. So from a genealogical perspective, they’re terrific for this group. Gray’s Inn notes, for example, that it has pension books, original admission registers, and records of marriages since its chapel was a popular venue in the early years. It adds that its archivists are “happy to provide information in response to historical and genealogical enquiries about the Inn and its members,”8 and provides a Contact the Archivist form. And at Lincoln’s Inn, you can find the oldest records of any of the Inns, dating back to 1422,11 and — best of all — a website feature called Archive of the Month. English legal society? Yes. But so much more. 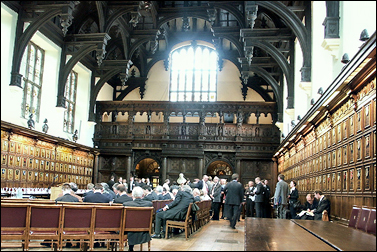 Image: “Middle Temple Hall,” Wanner-Laufer via Wikimedia Commons/CC BY-SA 2.5. My genealogical research leads me to ask a somewhat related question: What was/is a citizen of London. I can’t seem to find a definition or explanation. My impression is that it meant more than just being a resident of London. As an amateur’s attempt to explain….. In order to trade within the City of London (approximately within the old city walls), you had to be a Freeman of the City, also termed a citizen. In order to become a Freeman you had to be a Freeman of one of the Livery Companies (which originated as trade bodies, such as the Fishmongers or the Needlemakers. You gained this either by apprenticeship, by patrimony (your father was a Freeman) or by purchase. Being a Freeman of London gave you other trading privileges as well. There are lots of interesting records to follow up on all this. So what, if anything, is the modern role of England’s Courts of Chancery? My impression is that they were a sort of “prep school” for those desiring membership in an Inn of Court. Yep, the wikipedia article explains but be careful not to confuse the INNS of Chancery with the COURTS of Chancery which existed until 1873.